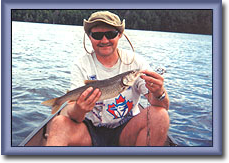 This method is excellent for Lake Trout fishing on smaller inland lakes in Algonquin Park, Quetico Park or any of the provincial parks that have great Lake Trout and Book Trout fishing. Please watch this video of 12-year old Christen catching a 10-pounder on 6-pound test line and a 3-way swivel. I want to show everybody how much fun Lake Trout fishing can be and all you need is your Walleye or Pike rod. They are not in a canoe but are using the 3-way swivel rig with light tackle. In the old days, people trolled with heavy wire line or heavy Bait Walkers. With these methods, you would have to use a heavy rod. With all this heavy equipment, it would certainly feel like you have an old boot on the end of your line when you catch a fish. This is why people think Lake Trout don't fight well. Using these heavy methods, you would not be able to control your depth, thus, not have your lure where the fish are so you would have to use big shinny lures or flashers in front of your lure. The odds of a Lake Trout hitting a really big lure are far less than a small lure, which is the same size as their natural food. Please Note: I have many people emailing me saying I am crazy and it is impossible to catch lake trout 50 feet deep with 6-pound test line. Please watch this 3-way swivel video. People that use steel wire get snags. When they can't get the snag out, they cut the wire off at the canoe and as a result, you have a 200-foot coil of steel wire in the lake. Loons, Otters and fish get caught in these coils and die. You can not bring steel cans into the park. Why have they not banned the use of steel wire fishing line? Avid trout fisher-persons are aware of the problem. Unfortunately, park biologists don't spend much time Lake Trout fishing down deep so they never bring up the big coils of wire that fisher-persons commonly catch. 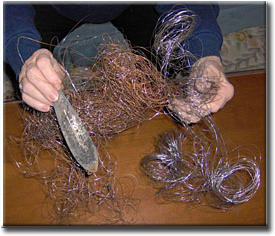 In six days of fishing (July 2003), we pulled over 1000 feet of steel wire out of Burnt Island Lake. In that time, we would be lucky to cover 1% of the lake. The problem is twice as bad on Lake Opeongo. The wire fishing line is stainless steel so it can last 30 years or more in low acidity water like we have in Algonquin Park. I have contacted park biologists and officials about the problem but they are not interested in talking to me. Please help me help the park by voicing your concerns. You need a light action rod, dark green 6-pound test monofilament line, 1 or 2-oz steel weights, a 3-way swivel, and small spinners or spoons. Please do not use lead weights, lead baitwalkers, lead core line or lead jigs. It is not necessary to poison the environment. Canadian Tire and Wal-mart sell steel fishing weights. Light Line: Heavy line is thicker and when you are trolling, it causes more friction with the water thus it is harder to get your lure deep. Thicker line is more visible, which scares the fish away. Thick line, generally, can not be used on light action equipment. If you use light line like 6-pound test, the line slices through the water so your weight goes straight down. You can fish 40 to 70 feet deep without having lots of line out. It's less visible so you will get 10 times as many fish hitting your lure. A person fishing with 8-pound test will find they are not catching nearly as many fish as someone using 6-pound test. It truly makes that much difference. Using dark green line helps even better. I recommend the Berkley Tylene XT 6-pound Green Line. If there is that much difference between 6 and 8-pound test, imagine how bad the fishing is while using 80-pound test wire. 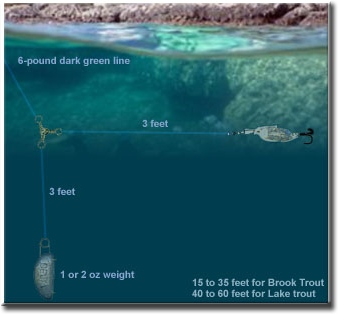 Light Action Rod: If you get a 5 pound Lake Trout on a heavy deep-sea trolling rod with 80-pound test steel wire, you will be lucky to feel the fish bite, let-alone have fun bringing the fish in. You might as well snag an old boot. Using a light-action fishing rod has many advantages. It's much more fun to catch a fish on a light rod. It's easier and lighter to bring with you on a canoe trip. You can feel smaller fish hit your line and it's sensitive enough that you can feel your sinker touch the bottom. Steel Weights & Swivel: You need a 3-way swivel and 1 or 2-oz steel weight. You can fish 45 feed deep easily with a 1-oz weight with 6-pound test line. With 2 oz, you can easily fish 70 feet deep. You need a 3-way swivel to keep your lure a couple of feet off bottom while your weights touch bottom once in a while. Take your 3-way swivel and tie a 3-foot length of line to the first eye. This is the line you tie to your lure. Tie a 3.5-foot piece of line to the second eye. This is the line you tie to your sinker. The reason the sinker line is longer is so if your sinkers get snagged, your lure will not get snagged at the same time. Tie the line from your fishing rod to the third eye of the 3-way swivel. Then tie on your weights and lure like the diagram to the right. If you are fishing between 20 and 45 feet, use a 1-oz weight. If you are fishing down between 46 and 70 feet, use a 2-oz weight. Don't bother fishing any deeper as many of the trout go dormant when they are that deep. Lake Trout like small lures. 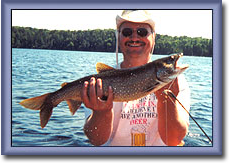 You will catch Lake Trout on small Mepps, small Blue Foxes, tiny Cleos, small William's Wabblers or small 2 or 3 inch Original Floating Rapalas. The very best Lake Trout lures are the ultra-thin silver-coated flutter-spoons and the two best are Sutton Silver Spoon or the MooseLook Spoon. The best colours are Silver & Blue, Silver and Green, just silver or Fire-Tiger. Now you know what equipment to use, you have to change the way you canoe. To troll for Lake Trout in a Canoe, you need two people and you have to work as a team. The person in the front of the canoe has to sit backwards. The canoe can never stop moving while you are trolling or the lines will get tangled or snagged. This way, the person in the front can drop their line while the person in the back paddles. When the person in the front reaches the bottom, reel up a foot and then put down your rod and start paddling backwards while the person in the back drops their line. Once the person in the back drops their line, they need to put down their rod and paddle. You only need the person in the back paddling while you are trolling. You only want to move just fast enough for your lure to work and no faster. If your canoe is moving too fast, it will be very hard to find the bottom of the lake. The trout will be close to the bottom. When a fish hits your lure, drop your paddle and set the hook as quickly as possible. As soon as one of you gets a trout on, the other person has to reel in right away so you do not get snagged or get your line tangled with the person that has a fish on. The most important aspect of Lake Trout fishing is letting out line to get to the bottom. DO NOT JUST LET YOUR LINE OUT UNTIL IT HITS BOTTOM. Hold the rod in one hand with the bail open. Let the line run through the palm of your other hand and grip the line. Once the canoe starts moving and you have a good straight troll going, open your hand with the line then close it again. This way you can let out a foot or two of line at a time. Get a rhythm going. Open, close, open, close. Your rod tip will bounce up and down as you release little bits of line at a time. The rhythm of your rod tip bouncing will be disrupted when your weight hits the bottom of the lake. When this happens, reel up a foot or two. The purpose of this procedure is to keep your 3-way swivel setup from getting tangled. If it gets tangled on the way down, it means you are letting the line out too fast. You need the forward motion of the canoe to keep the lure horizontal and away from the sinker line which is vertical. Trout are funny when it comes to hitting your lure. Small ones will hit and then take off so you know you have a fish on. The really big trout will hit the lure and slowly swim away. They are so big they don't know they' re hooked. So if you get a snag, make sure it's not a fish before you start toughing on your line. If it's a big trout, loosen the drag on your reel because they will go nuts and strip a 100 feet of line off your reel before you can turn them. You should always keep your drag set based on the strength of the line. The fish is not going anywhere so if the fish wants to run, let him. In the summer time, Lake Trout hit best in the morning between first light and 10:30 AM. They will hit better if the surface of the water is dead calm and it's a clear sky with high pressure. Any other conditions will cause them to slow down. If it's early spring, the trout seem to feed in other parts of the day; thus they are easier to catch. In some lakes the trout feed before dark. If a small isolated micro-storm goes through your area, the trout might start feeding because as the storm moves away, the pressure will start to rise, which will trigger feeding. Take a close look at the structure of the shoreline and try to extend the elevation patterns into the lake. If you see a cliff, odds are the water is deep at its face. If you see a string of islands, odds are there is a shallow shoal that runs between them. Trout like drop-offs so you would want to troll parallel to the string of shoals and not over them. When you drop your line to the bottom, count how many times you let out line. You can get a good estimate of the depth. Try to stay in 40 to 60 feet of water. If you come across a spot and catch a trout, odds are there are more of them there. The wind is very important when trout fishing. Traditionally for warm water fish like Walleye, bass or Musky, you would fish on the side of the lake were the wind is blowing. The logic being that the fish follows the surface food that is being blown in. With trout it is the exact opposite. The wind also blows the warm surface water, which does not hold enough oxygen for the trout. Thus fish the side of the lake where the wind is coming from. In the spring, the Lake Trout will be right up to the surface. As the water starts to warm up with the changing weather, the trout start to go deeper. Here is the approximate depth for different times of year. This is not true for all lakes. Some smaller spring fed lakes will have Lake Trout shallow all year. The small lakes in the park will have the best trout fishing in the heat of the summer as they are concentrated in the deep holes and not spread out like they are in spring or fall. Summer --> The trout are concentrated in the deep holes in the 45 to 65 foot depth range. Occasionally you will find them deeper or shallower but the 45 to 65 depth-range is best. This is based on small spring fed lakes in the park. On big lakes, the hungry trout are usually found suspended in 53-degree thermal layers. Using 6-pound test line, light action rods and 1 or 2-oz bell sinkers on a 3-way swivel rig, we catch tons of trout. We go into the park for 10 days every year and generally we catch 1 trout for every hour of trolling. We know the lakes extremely well. Your first time out, you may not have that kind of luck but hunting down the trout by exploring the lake is a lot of fun to. It's common to troll for 4 hours and get nothing, and then catch 4 in a matter of minutes. Lake Trout turn on and off like a light switch so you need perseverance to be out at the right time and place. Most trout we catch in the park are 2 to 10-pounds. In 2001, My friend Dean Robinson from Waterdown, Ontario caught a 22-pound Lake Trout. I can not possibly put into words the fun and excitement we had bringing in a 22-pound lake trout on a light action rod in a canoe. It took us an hour. The fish towed us around. We release the fish like we do with most fish. If you catch a Lake Trout and it's not bleeding let it go. Only keep fish that are injured. Lake Trout are coming up from the depths so you have to release them right away. Their air sacks have expanded and they need to get back down deep before their organs are damaged. Lake Trout up to 4 pounds taste awesome. Lake Trout taste way better than Rainbow Trout (Steelhead Trout), which in my opinion, taste more like salmon and not like our indigenous trout species. I never order trout in a restaurant. They always serve it covered with dill sauce or almonds, which in my opinion, tastes like crap. This is another reason why a lot of people are not crazy about eating trout.